An undefeated maiden triple ton by the skipper Michael Clarke and encouraging century punched by Michael Hussey guided Australia to a mountainous first innings lead of 468 runs against India at Sydney. The visitors feel themselves in hot waters after losing two top order batsmen in their second innings. India was let down in the first innings by the dreadful fast bowling of the Kangaroos on 191runs. The home side declared their first innings at hefty 659 runs when they had lost just four wickets. 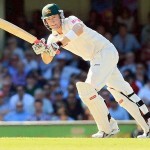 The visitors were fighting back at 114 runs after losing two wickets at stumps on day three of the second Test at Sydney Cricket Ground on January 5, 2012. Earlier Australia started the third day at 482 runs for the loss of four wickets in 116 overs, Clarke and Hussey were unbeaten on 251 and 55 runs respectively. Zaheer Khan started the attack, Ishant Sharma assisted from the other end while both maintained line and length as both batsmen remained watchful in initial few overs. Hussy smashed three figures on the fourth ball of the 143rd over when he stole a single off Virender Sehwag . He was under tremendous pressure for quite some time and thrashed century after the lapse of 10 innings. The left hand batsman scored his last hundred against Sri Lanka at Colombo in September, 2011, his contribution was nominal after that and in fact, got three ducks as well. He made a valuable contribution of 89 runs in the first Test at Melbourne Cricket Ground and started his journey towards prosperity. Clarke was doing well at the other end and sent the ball to the ropes at will and completed his grand 300 runs by dispatching another four past midwicket on the second ball of the 151st over from Sharma. The whole stadium was erupted and all of them stood up from their seats to acknowledge the first triple ton by the Australian Captain. Hussy completed his 150 runs on the fifth ball of the 163rd over and Clarke declared the innings after the next delivery at 659 when India was unable to take any further Aussie wicket on the third day. India was under tremendous pressure when they initiated their second innings as they conceded a first innings lead of 468 runs. They had a disastrous start when David Warner held an acrobatic catch of Sehwag on the third ball of the fourth over from Ben Hilfenhaus. The score board reflected 18 runs and sehwag contributed mere four runs when the wall of Indian batting, Rahul Dravid came in the centre and joined with Gautam Ghambhir. Gambhir adapted his natural way of his game and the change was obvious when he dispatched consecutive fours to Peter Siddle in the seventh over and Nathan Lyon got the same treatment in the 12th over. 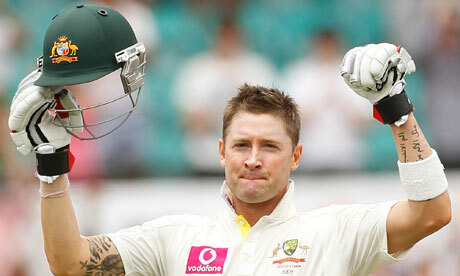 He completed his quick fired fifty in the 17th over on 54 balls with the help of eight fours. India faced another blow when the smooth going Dravid was deceived by a delivery from Hilfenhaus which went through his bat and pad while uprooting his off stump. He was gone after scoring 29 runs assisted with six fours and contributed 82 runs for the second wicket when the little master appeared on the scene. The visitors had reached at 114 runs for the loss of two wickets in 41 overs at stumps on the third day, Ghambhir and Tendulkar were unbeaten on 68 and 8 runs respectively. Hilfenhaus claimed both wickets and the other bowlers were unable to penetrate through the defences of any batsmen. India faces an uphill task in saving the second Test as still two days are left in the match but as long as Tendulkar is there any miracle is possible from his blade.